It is an industry standard to measure the duct work or actual hole in the floor. Take out the existing floor register or grille, and measure the length and width of the opening in inches. Still need more help? Read our informative blog on how to properly measure for a floor register. What is the difference between a floor register and a floor return grill? A register is an adjustable, vent device through which heated or cooled air is released into a room. Registers will have a fully adjustable damper which allows you to control the airflow. Floor return air grilles are used as return or exhaust air inlets to the ducts in your home. Because air does not come out of returns, adjustable dampers are typically not included. For more information on this topic, check out this blog entry. No, you don't need to setup an account to place your order. Setting up an account simply allows you to save your billing and shipping information, so you do not have to enter it on every order. An account also allows you to setup multiple shipping addresses, view previous orders, or request an RMA (Return Merchandise Authorization) Number. Call us:Toll free at (866)-258-1554 or our local number at (608)-244-1226 (Major Credit Card Needed). Please see regular business hours above. Your credit card was not issued in the USA. Our website will not accept orders outside the continental US. Please contact us for additional payment options or for a shiping quote if needed. To make our website more user-friendly, similar products are grouped together. 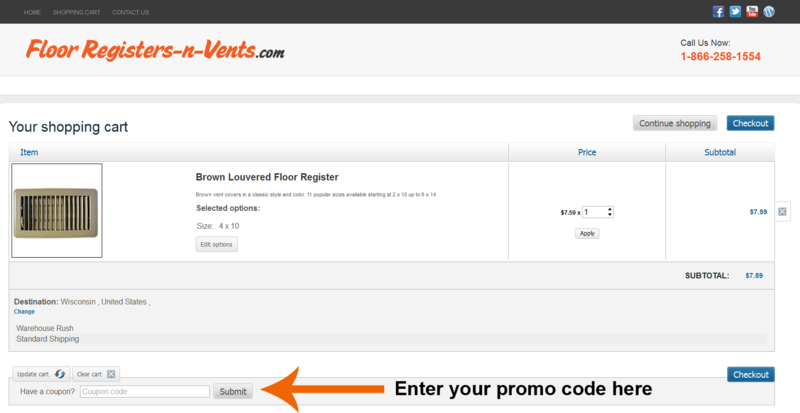 For example, our Brushed Nickel Victorian Floor Registers in multiple sizes can be purchased from the same page. When you click on the drop-down menu, you will see a list of sizes/colors etc. When you choose the size/color you need, the price (shown in orange above the drop-down menu) is updated to show the correct amount. Third party coupon sharing sites are submitted by the general public and not FloorRegisters-n-Vents directly, and unfortunately they are not always valid. We strongly advise that you check any offers, discounts or coupons that you may want to use with our sales staff before trying to apply them with your order. 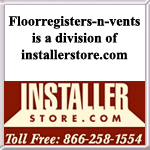 All discount code/offer questions can be directed to sales@installerstore.com via email or call toll free 866.258.1554. If you are uncertain if you have ordered the correct item or you have any further questions, you may always contact us at: 866.258.1554 or 608.244.1226, or E-mail us at: sales@installerstore.com. Please see our regular business hours above.